I cannot stress enough how important it is for anyone considering to have a puppy/dog to learn about the breed prior to making the decision to get a puppy/dog. I believe every pet should be given a fair chance to lead a long, healthy, and happy life in a loving home. Please make sure that your lifestyle permits you to make a long term commitment to give your pet all the love, care, stability and, attention that it deserves. 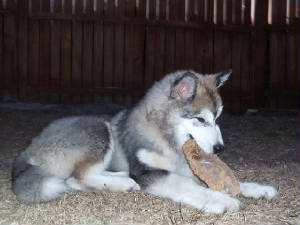 All my Alaskan Malamutes are AKC registered. Copy of Sire's and Dam's pedigree, AKC registration application, vet examination(s), deworming, up to date vaccinations, vet record and microchip are included in price of each pup. I guarantee the health of my puppies against life threatening genetic conditions for one year. Puppies must be examined by your vet within five days from the date of arrival from my home to yours. Buyer must show written proof from a licensed, practicing veterinarian that the puppy has been up to date with his/her examinations/vaccinations in order for the one year health guarantee to be honored. If puppy has any genetic problem(s) that my vet agrees is life threatening, I will offer the buyer the option to have the cost of that puppy refunded in exchange for that puppy vs having another puppy from a future litter in exchange for that puppy. Buyer is responsible for all shipping fees related to puppy's return to me. Unless discussed and approved, puppies will be sold to pet homes with limited akc registration (meaning NO breeding rights). Puppies sold with limited akc registration are to be spayed/neutered by age 6-months or this contract and health guarantee is null and void. Full AKC registration may possibly be considered for certain puppies of selected breedings to approved homes. There is an additional $1,000 fee for puppies sold with FULL AKC registration. If for whatever reason buyer is no longer able to maintain one of my puppies/dogs, I will assist buyer in finding a new home for the puppy/dog and/or I will gladly accept the puppy/dog back but, no money will be refunded to buyer and buyer is responsible for all travel expense related to the puppy/dog's return to me. A $150 non-refundable deposit is required in order to be placed on the waiting list for a pup. All deposits received count towards total price of pup. Deposit(s) will only be refunded if the requested gender of pup is not available or pup is not available from the litter for which deposit was placed (unless buyer requests to have deposit go towards a pup from a future litter). Another non-refundable deposit for the amount of $350 towards the purchase of your pup(s) is due within 3-days from when the puppies are whelped in order to hold your place on the waiting list. Pick of the litter to be selected by the time the pup is 4-weeks-old in order to give all puppies the opportunity to secure forever homes as early as possible. Persons to choose their pick of the litter according to the order on the waiting list. I maintain the right to have first choice for pick of the litter. Puppies expected to be ready to go to their forever homes between 8-10 weeks-old. Please contact me before sending any payment as my puppies go to approved homes, only. Full payment for your choice of pup is due by the time the puppy is 7 weeks old (unless otherwise agreed). Otherwise, you forfeit the money you have placed to reserve the puppy of your choice and that puppy will be listed as "available" for adoption. Shipping is available but, not included in the price of the puppy. Average cost of shipping (depending on size/weight of pup/crate and where pup is being shipped) is $400. Shipping cost includes airfare, flight insurance, crate, food and water bowls, mat for crate and travel health certificate required by airlines. Will accept paypal, cash, or check as methods of payment. Checks must clear prior to puppy leaving my home. If interested in a puppy, please contact me, Cecilia, at 239-289-1939 or via email: stfrancismal@aol.com . Puppies are each $1,600. Price of puppy includes Limited AKC registration application (Limited AKC means No breeding rights) unless discussed and approved for full AKC (there is an additional $1,000 fee for full AKC); vet exams; UTD on vaccines; health certificate; deworming at weeks 2, 4, 6, & 8; microchip; copy of dam/sire's pedigree and one year health guarantee against life threatening genetic diseases. Please read my CONTRACT for health guarantee and payment details. Shipping is available but, not included in price for puppy. Cost of shipping an 8-10 week-old pup, within the U.S. typically averages $400. Shipping price within the U.S. includes airfare, flight insurance, crate, food and water bowls,mat for crate and travel health certificate. Shipping outside of the U.S. will be considered on an individual basis and at buyer's expense. If interested in a pup, please contact me at 239-289-1939 or via email: stfrancismal@aol.com . Thank You! Your Alaskan Malamute will love you, please love it too!